Navratri fasting comes to an end on Ashtami (eighth day). This day is celebrated with a lot of enthusiasm all over the country. Food and offerings are made to ‘Maa Durga’ (Goddess Durga). Many Hindus worship little girls ‘devi’ to symbolise them as the ‘Goddess‘ herself. This Pooja is either done on Ashtami or in some families, Navmi (ninth day). This is usually known as Kanya Pooja or Kanjak Pooja. The ritual is to wash the feet of these little girls and then offer them beautiful ‘chunnari‘ (colourful scarves) along with bangles, toys among other attractive gifts! 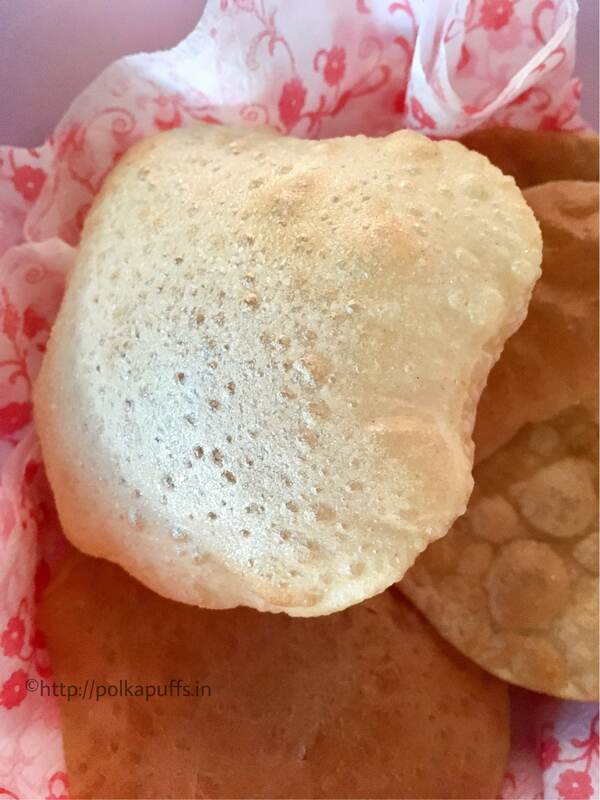 They are then offered delicious food too….that’s when Sookhe Kaale Chane is served along with Poori and Sooji/ Rawa/ Semolina Halwa or Pudding . And trust me..it’s a divine combination. 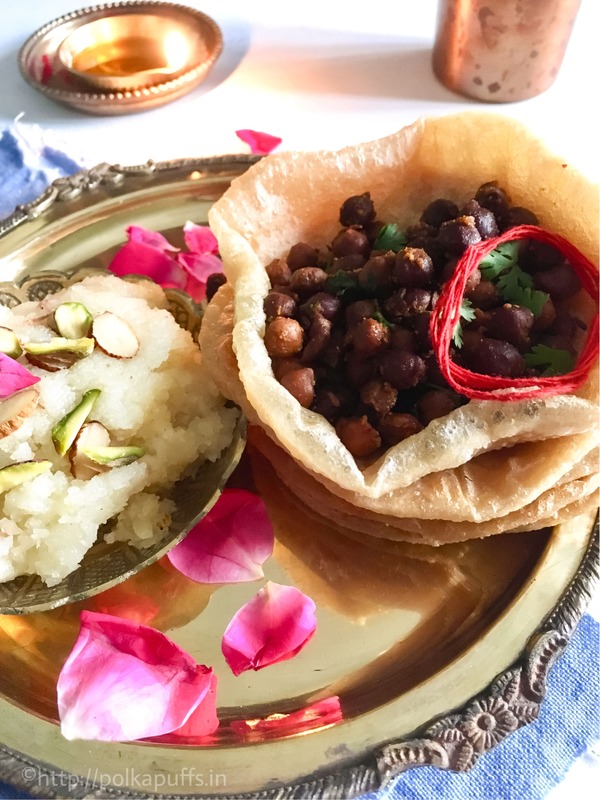 Sookhe Kaale Chane Puri Aur Sooji Ka Halwa/ Sooji ka Halwa/ Mata ka Bhog/ Spicy Bengal Gram Recipe/ Kanjak Bhog Recipe/ Kanya Pooja ka Bhog/ Ashtami ka Bhog/ North Indian Ashtami Bhog recipe/ Navratri Menu includes Hot, fluffy Pooris with the spicy Sookhe Kaale Chane and that Halwa studded with dry fruits and lots ghee is to die for! This is the menu served all across the Northern Part of India. I am not too sure what goes into the menu in other regions as there is a lot diversity when it comes to celebrating festivals in India. I remember when I was a little girl, I used to go visit a few places as my Mother’s friends would invite me over for the Kanya Pooja! It was so much fun…and then later I would have my friends and some other girls over at my place for the same Kanya Pooja 😀🙏🙏 and we would all tuck into this delicious meal. 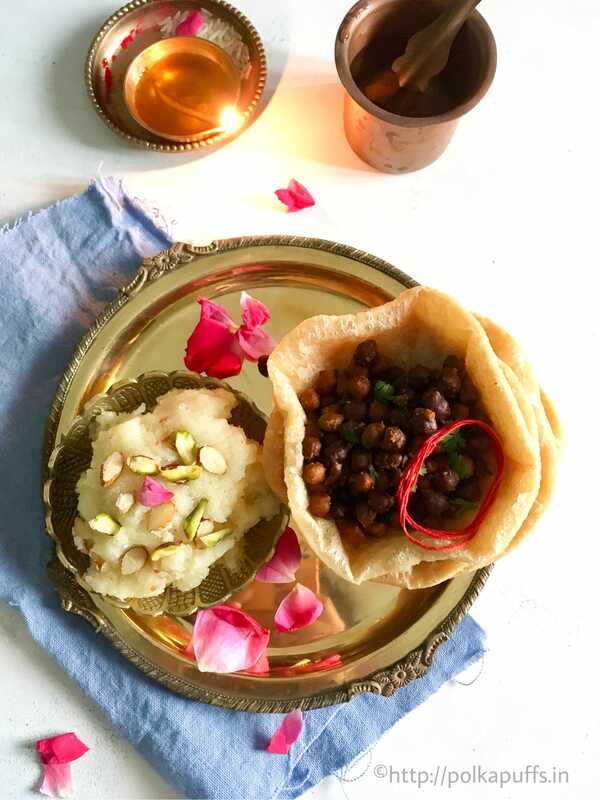 Although, all over Northern India, the recipe for these Chane and Halwa remains pretty much the same…just an ingredient here or there might be different. Once the chane have been boiled, drain all the water and set them aside. Now, heat the wok, once it’s hot enough, add the oil. Now, add the cumin seeds and asafoetida. Let them splutter a bit. Next, add the boiled chane and season with salt. Mix well and add the other dry spice mentioned above. Mix them well. Cover with a lid and let it all cook for 4-5 mins. As the chane are boiled, we don’t need to wait too long for them to cook. Once done, turn off the gas and garnish with chopped coriander. 😬 that’s it, it’s ready! Equipment: a large mixing bowl, measuring cups/ spoons, a wok, a slotted spatula, rolling pin, rolling board. Take the flour in the the mixing bowl, add salt and carom seeds to it. Give it a good mix. 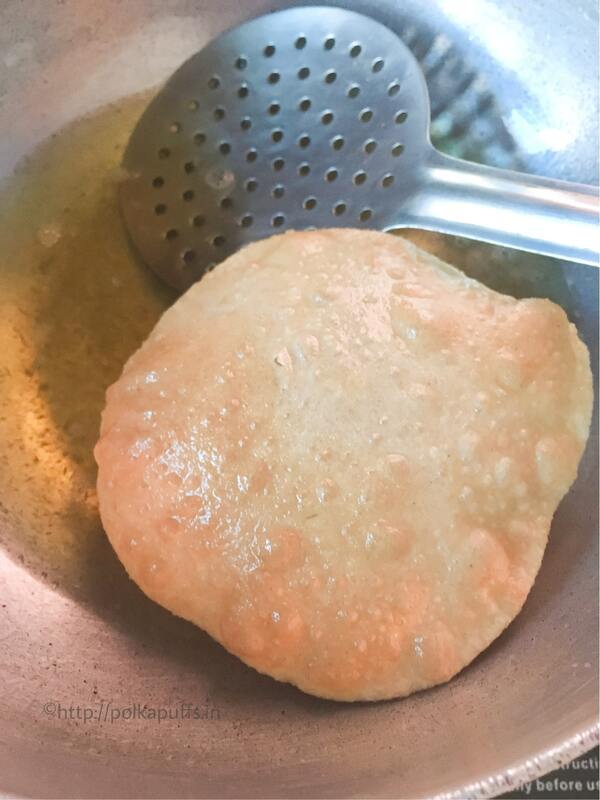 Make a well in the centre, and add the ghee in the well and mix again. 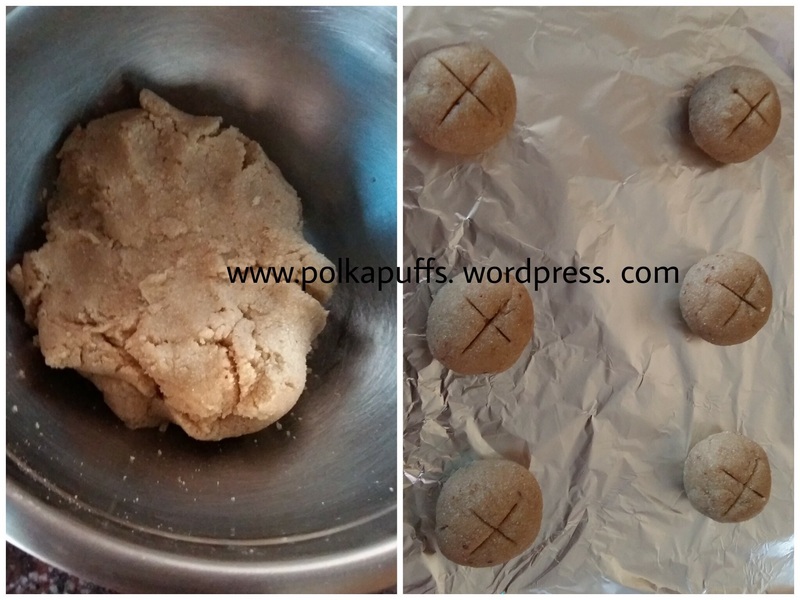 Now add water little by little into the flour and make a firm dough (kadak). Cover it and let it rest for about 30 mins. Equipment: a heavy bottomed wok, a ladle, measuring cups/ spoons. Heat ghee in the wok, then, add sooji and roast it on medium flame until it turns slightly golden. Now add the milk and water in the roasted sooji. Since this recipe uses Glutenfree flour, you will have to work very carefully while making the dough and keep an eye on it while baking too. Let’s get started with the recipe. 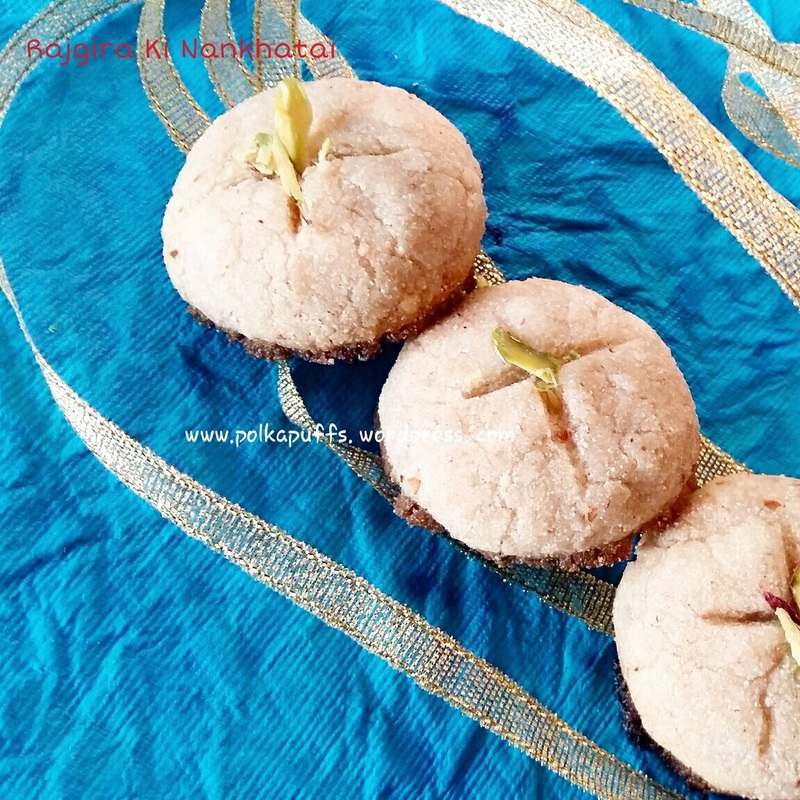 Yield: 18-20 Nankhatai depending on the size. Equipment: a large mixing bowl, blender, a knife, measuring cups/ spoons, baking tray, aluminium foil, a cooling stand. In a large mixing bowl, add the powdered sugar, ghee and cardamom pwd. Mix it all well. Then add the almond powder too and mix again. Next, add the Rajgira atta and slowly also pour some water. Mix well with your hands. It won’t be a tight dough. So bring everything together carefully and cover the bowl. Keep the covered bowl in the refrigerator for 15 mins. Pre-heat the oven for 10mins @ 170’c. (Pls note that every oven works differently, so you will have to adjust the temperature and baking duration according to your oven). Line the baking tray with aluminium foil. Adapted from The Times Of India. But the fact remains that my hubby has to go to work every morning and I love packing his lunch box! So during Navratri…I pack food that’s without onion-garlic. along with cucumber slices and some fruits to balance the meal. 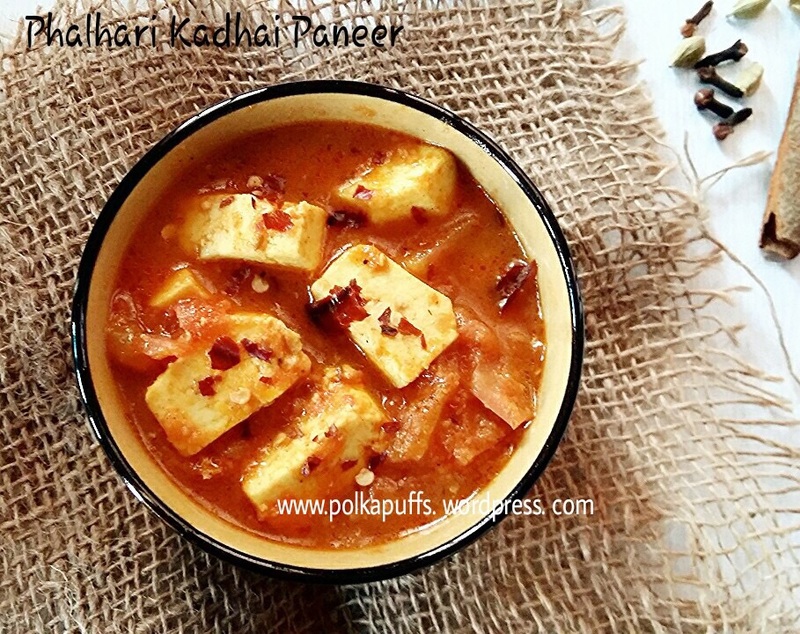 So decided to pack Phalhari Kadhai Paneer today for his lunch box along with Rajgira ke Parathe (not in pics). 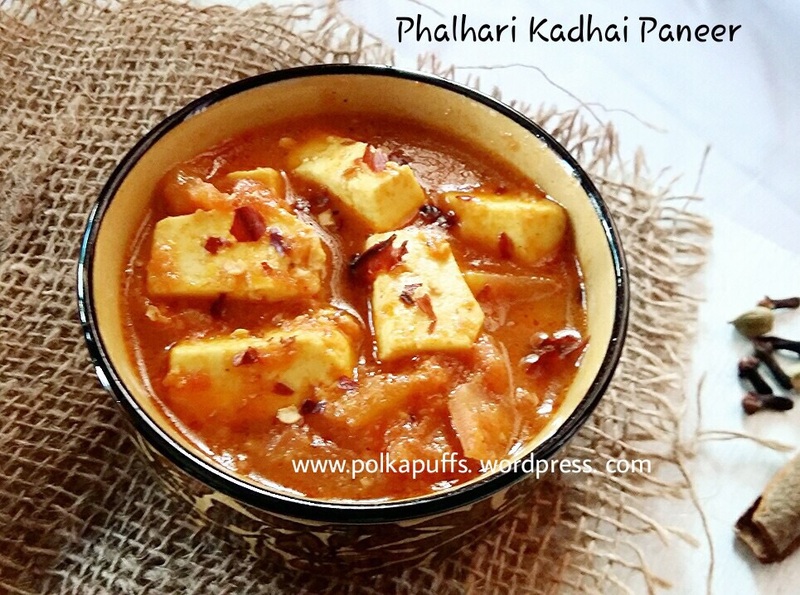 They are very healthy and make a good accompaniment to the Phalhari Kadhai Paneer 😀 I was looking for a good paneer (cottage cheese) recipe and this one is perfect! 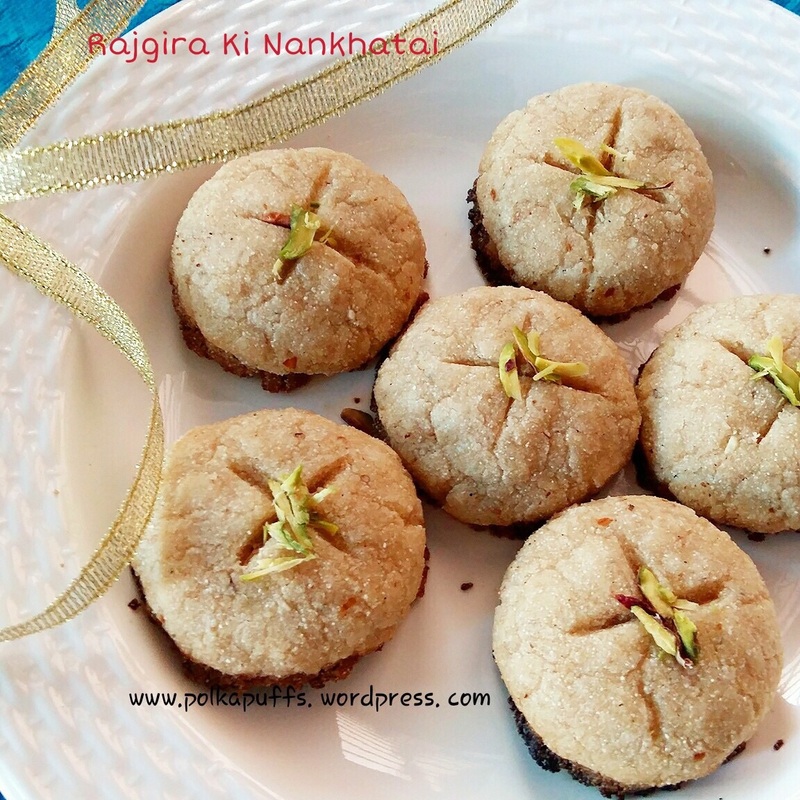 This recipe is very quick and required little efforts too! Let’s get going with it..
Equipment: a non stick pan/ wok, measuring cups/ spoons, blender. First, blend together 1/2 cup chopped tomatoes with all of the ginger and green chilly using 1 tbsp water. Make a smooth paste. Set it aside. Dry roast the cloves, peppercorns, cinnamon, cardamom and cumin seeds for 3-4 mins in the wok…careful not to burn them. Let them cool for a few a minutes. Grind them to a powder or little coarsely (if you like coarse spices) and set it aside. Now, heat the wok and add ghee. Once it’s hot, add the paste you have made and sauté on medium flame for 5 mins or until the raw smell goes away from the paste. You will see some of the ghee separating from the sides too. Now add the sugar, salt and degi mirch (optional) and approximately 3/4 tsp of the spice powder you have kept aside (the remaining spice powder can be stored in an airtight container for about a month and reused in any curry). Mix everything well and cook for another 3-4 mins. You can add some water to correct the consistency at this point (I added less than 1/4 cup of water). Next, add the remaining chopped tomatoes and cubed paneer. Stir carefully to avoid breaking the paneer. Now cook for another 6-7 mins. The paneer will absorb all the flavours and the tomatoes too will cook well. If you like, you can sprinkle some more of the spice powder at this stage (I did not as I was worried it will be too spicy)..turn off the flame. You can garnish with some chopped coriander leaves…I didn’t have any today..so I skipped it! 😬 It’s ready!